I met these two beautiful ladies at McDonalds on 159th & Central. 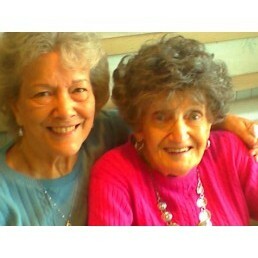 Their names are Helen & Gerta. Helen is a sweet little lady who needs prayer for her arm. And Gerta with her sweet smile says she needs prayer for her health. These ladies were a blessing to me and they said I was a blessing to them. Please pray that God would use them just as He used me to touch them. This entry was posted on Saturday, August 20th, 2011 at 3:11 pm	and is filed under Janet Schroeter's caseload. You can follow any responses to this entry through the RSS 2.0 feed. You can leave a response, or trackback from your own site. Lord I have not seen these ladies since we prayed for them that day. Lord if you want me to see them again I know you will open up the doors. You leading of the Holy Spirit is so perfect. So we just lean on the leading of the Holy Spirit. May God bless these ladies where ever they are.